This download contains Dr. DivX, the first and only official DivX encoding application from the creators of DivX. Dr. DivX comes bundled with the DivX Player for perfect playback of all DivX video content including DivX Video-on-Demand (VOD) titles, and the DivX Pro codec �€ " a US $19.99 value and the highest-performance and most advanced video codec in the world. Dr. DivX is designed to let anyone create high-quality DivX video in 3 easy steps. Simply choose the video, select settings and click Encode. Once encoded into DivX video, entire video libraries can be stored on hard drives without gobbling up storage space. 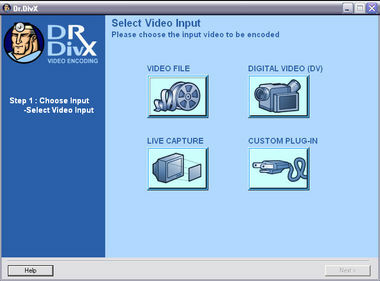 Dr. DivX accepts video input from a variety of sources including MPEG-1, MPEG-2, MPEG-4, DV, AVI, WMV, AVS and live capture from a capture card or a Webcam, and quickly converts these files into highly compressed DivX video, creating high-quality video you can post online, burn to a CD or email to friends over broadband networks. And, the DivX Certified encoding profiles built into Dr. DivX let you create DivX video optimized for playback on the full range of DivX Certified hardware devices. Dr. DivX is the easiest way to create great looking DivX video.